Insulated lid for the 1000 litre Intermediate Bulk Container (IBC) Heater, with centre top opening flap. Full length side and top one-piece insulating cover. The lid can also be used for both the standard as well as the Ex-rated IBC heater. Reduce heat-loss to a minimum! Standard size to fit industry standard containers (thus have an adjustable length of 4060-4310mm and are 950mm wide). 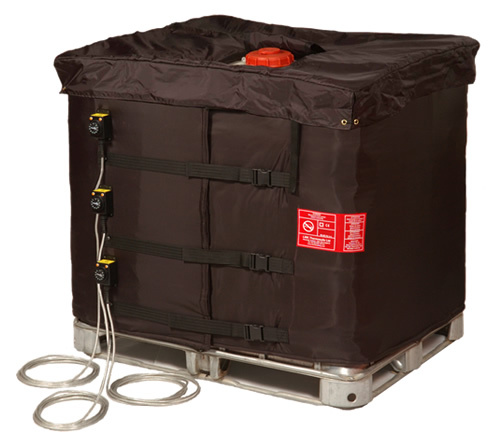 Insulated IBC lids reduce heat-loss to a minimum. They are supplied with a folding flap in the middle for access to the centre fill-cap. Outer surfaces of each jacket utilize tough, water resistant nylon materials. Inner layers are manufactured using unique coated glass cloths for protection from chemicals and long term temperature durability. A heavy duty waterproof p.v.c. cover is also available for additional protection when used outdoors.